Body Attack Low Carb Protein Pizza is a convenient mix for self-preparing a low-carb pizza, based on almond flour. The product is enriched with balanced milk protein and an egg white. Due to adequately selected ingredients, the pizza is characterized by a very low carbohydrate content. 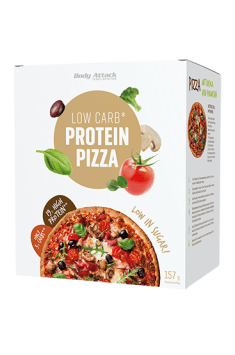 Body Attack Low Carb Protein Pizza is an ideal option for a nutritious meal and a "safe" alternative to traditional pizza when being on a low carb diet. The dough alone contains only 5.9 g of carbohydrates per 100 g of product and as much as 38 g of protein. Ready-made pizza has an energy value of 355 calories per 100 grams. In addition to almond flour and wheat protein, the ingredients of the dough also include milk protein, egg white powder, and iodized salt. The finished product provides the body with 19.4 g of fat (of which 2 g is saturated fat), 1.9 g of salt and 2.8 g of dietary fiber per 100 g.
The effectiveness of most of the slimming diets is based on reduction or a complete elimination of carbohydrates. Such a trend is popular not only among people who lead a "regular" lifestyle, but also high-class athletes. In case of physically active people, it is particularly important to additionally supplement the level of protein so that the body does not use its own protein (muscle) stores for energy needs. An effective fat reduction process may be crucial in bodybuilding sports or disciplines divided into weight categories. Body Attack Low Carb Protein Pizza is a product with a minimum content of carbohydrates and a large amount of protein, which can be an effective supplement for any reduction diet. Proper protein intake combined with an intensive training allows increasing of the muscle mass. Protein is also a fundamental structural and functional component of every cell in the body that is essential in the development and regeneration of damaged cells and tissues. Proteins, among others, are biocatalysts of many enzyme systems, they regulate gene expression, participate in numerous metabolic processes, and, as antibodies, participate in cellular and humoral immunity. In addition, proteins are responsible for the transport of oxygen (hemoglobin), iron (ferritin) or retinol – vitamin A, and as actin and myosin, they are muscle contractile elements, and they also display buffer properties determining the regulation of acid-base balance. In summary, Body Attack Low Carb Protein Pizza is an ideal high protein meal that can satisfy diet whims of people on advanced reduction. This delicious pizza can also be a rich protein meal in any other nutritional model. The finished product can be individually suited, by adding favorite ingredients (e.g. cheese, ketchup, olives, vegetables, any type of meat or mushrooms). Add 2 teaspoons of olive oil and 150 ml of warm water to the contents of the package, and then mix until smooth. Then leave the dough for about 25 minutes in a warm place. In the meantime, warm up the oven. Spread the dough evenly and thinly on a baking tray lined with baking paper, adding any ingredients (e.g. olives, vegetables, chicken breast or mushrooms). Bake for 25-30 minutes at 200°C (180°C in recirculating mode). Almond flour (37.5%), Wheat protein (35%), Milk protein (11,5%), Hen egg white protein powder (8%), Dried yeast, Iodised table salt (Table salt, Potassium iodide), Separating agent (silicon dioxide).